You don’t need to make the yarn pass back and forth while winding. “Ayacopia” does it for you! Point 1 : the Yarn will pass back and forth automatically with the Ayacopia. 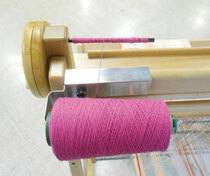 Ayacopia is the winding assist tool that passes the yarn back and forth automatically. 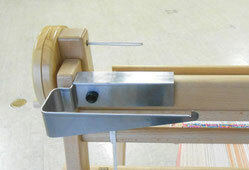 It is possible to wind yarn to a bobbin by one hand. It is good for people who have difficulty winding or people who have lost the use of a hand. You don’t need to worry about the yarn getting stuck in the shuttle anymore. Point 2 Compatible with most SAORI Winders. You can use the “Ayacopia” as your SAORI yarn winder! * A few old winders are not compatible the “Ayacopia”. Please check the youtube video. You can do the winding easily by one hand with the “Ayacopia”. You can choose for 2 kinds of Ayacopias “Tsuru” or “Kitsutsuki”. The wooden Ayacopia is called “Toki” (It means ‘Japanese crested ibis’ in Japanese) An attractive, smooth to touch wooden unit. Needs a +(Phillips) screwdriver to attach it. You can purchase these products in our SAORI online shop.